. . . and two super cute videos! Children's Medical Center did a photo shoot today; they are doing a piece about Seth. David can walk all he wants to, but he thinks crawling is faster. He's having fun climbing our Little Tyke's slide, but then he stands at the top and yells (first in triumph, then for attention to get help in getting down!). He also enjoys trying to walk the transition between types of surfaces - grass and pavement, stepping over the lip of things. Cute! 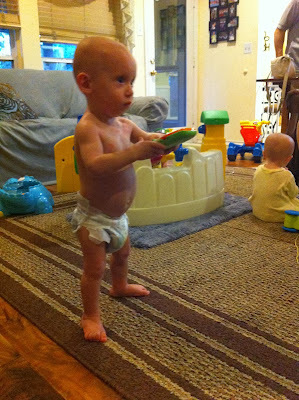 Will, meanwhile, has started standing quite a bit and gets into a standing position by just starting from a squat. He's taken a few more steps. He tends to walk like a drunken sailor, though. It's pretty adorable! Babies all ready for an outing to the "interactive fountains" at Uptown Village in Cedar Hill. David can actually crawl around on the "grass" there because's it's astro-turf. He's allergic to real grass and breaks out into a rash, which is hard because he loves to explore the backyard! 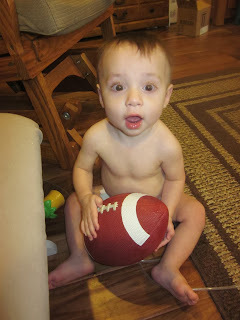 Will Will follow in Granpadad Neal's footsteps as a football player? This picture of David looks so much like a picture of me as a baby. I wish I had it at hand! 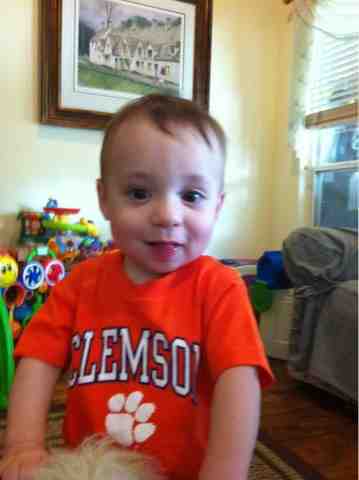 But everyone agrees, hands down, that David is a "mini-me" of Gavin. Someone said this week, "It's really weird feeding David, because I look down at his head and feel like I'm giving Gavin a bottle." David's latest funny thing is giving monologues in his own language, full of intonation and expression, and looking like he's waiting for the proper response from us. We're not quite sure what that response is, but we think he's adorable! Marcie continues to flash her very gorgeous smile. She smiles SO big she has to rear back and tip her head back even to fully express her joy!She also sits super cute, with her knees bent so her legs face backward, making a W with her little bottom. She is definitely the most obvious of the two girls about being a Mama's Girl, which of course this mama loves (although it can create some stress, too, when Mama can't hold her just then!). Gracie seems to really love me too, though, "gyrating" in place for attention - legs and arms moving constantly, up and down, in and out - or coming to me to be held. Both girls are also crazy about Daddy. This one deserves re-posting. Our sweet Gracie makes the most darling little coo-ing sounds and says, "mee-mee-mee-mee" and "bee-bee-bee-bee" and soft little "ba's" in addition to her long baby talk "sentences." She chortles like the world is the funniest place ever and she is the funniest person in it! Her joy and silliness is just contagious. Will is LOUD and very, very expressive. He will shriek or growl or babble off "sentences" with a ton of expression in his face. It cracks us up when it's not SO loud we can hardly think! And even then, sometime you just gotta laugh! He is very quick to let us know when he doesn't like a situation or is DONE with an activity (eating being the main one - he shoves it in like you wouldn't believe, then is absolutely intolerant of sitting there any longer). He doesn't suffer in silence. I think he's more like me than his father in that way. :} A little girl at the fountains in Cedar Hill came up to me and said, "Your baby keeps growling at me. What does that mean?" I told her it's just his way of talking. Will is the most aggressive baby right now. That can be a problem sometimes because he's so much bigger than the others and can just move them or remove them or things from them at will. They will cry, but no one fights quite as hard as he does to get their way. Of course, that could change next week. Marcie used to to be the dominant one, and before that David was. Now both will just cry and let Grace and Will and even Seth lord it over them! Last night Seth was grabbing toys from Marcie (who loves to fit the shapes into the shape-sorter), and she just let him, sweet girl. Precious Seth sucking on a pacifier. He is ALL OVER THE PLACE now! 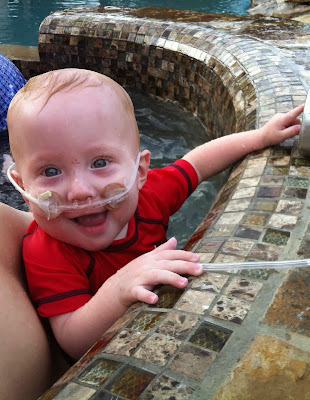 He even unplugged his own oxygen concentrator today; Sam came out to find him happily waving the cord in the air. Crazy kid! We have barriers up, but he manages to problem solve his way around them. It's such fun to watch him go, go, go. 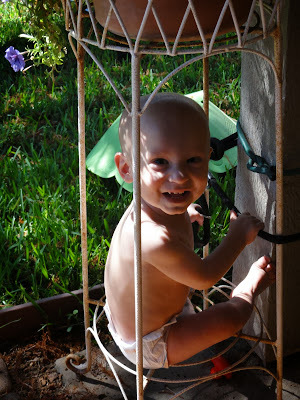 He crawls a really funny way now; his therapist says he's decided it's HIS way to crawl, period. He tucks his right leg under him like he's about to sit Indian-style and pulls himself along the floor with just his left foot and hands. It's like he doesn't want his knees on our hard floor. :) But he pulls up and walks with both legs equally well, so his little idiosyncrasy doesn't matter. 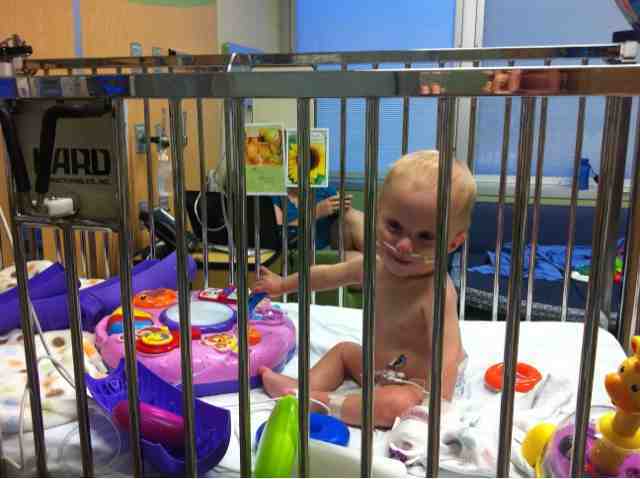 He's requiring less oxygen and was even off for a few hours recently, satting just fine. The fever the other kids have had still hasn't turned into anything after all! Maybe the Lord is really holding it at bay in answer to your prayers! Another praise: Seth's speech therapist said he did the best and ate the most he's ever eaten for her when she was last here. She said she'll be "shocked" if he's not taking all his food by mouth in 10 months. I so hope and pray that's true! The little baby birds at the feeding hand of their Grandpadad. They absolutely MOB him the moment they see he has any food in his hands! In other news, thanks for praying for me. The Lord has mightily answered, and I feel like I've had some great time to decompress thanks to the wonderful ministry of others. I can't express how much I appreciate your prayers. I told Gavin, "I just want to sit on the porch of a cabin in the mountains by myself and read some magazines." He agreed the cabin and the mountains part sounded nice. :) I'm sure he'd happily read a woodworking magazine, but then he'd have to go put it into practice! Anyway, obviously we can't make that vacation a reality, but we can find peace in the midst of the circumstances in which God has placed us because He provides a way to stand up under it all. He just proves over and over again that He does it all for us and in us, using us weak people so only He gets the glory! Speaking of God providing, one of His very greatest provisions for us these past many months has been our Nanny Sam. She is returning to Michigan the middle of next month to go to nursing school. We are so proud of her and so grateful she was here to keep us sane and help us meet Seth's many medical needs since late January. We pray Seth does NOT need to go back to the hospital because I don't know how we could do it without Sam! Besides that, the babies and Isaac just love her. She has a real gift with children and a level head and will be greatly missed. Anyway, today I hit a wall. When I started trying to ask the speech therapist questions about feeding Seth, I fell apart. I just could not stop crying for the next hour or so. I think it had to do with the chaos around us, the strain of getting Isaac's homework done and getting him to school late (My first big mistake was not calling in Gavin to HELP! but he had a doctor's appointment anyway. ), and then Will starting a runny nose. Remember those lurking fevers? Well, they lurk still, and we are still trying to keep Seth separate - another big stress. I don't want him back in the hospital. Anyway, Gavin has been wonderful. He brought me flowers. He brain-stormed with me on how to help the situation(s) as a couple. He encouraged me to call him ASAP when something's brewing. I THANK GOD for a husband who is so supportive and loving!! The video is a good glimpse into life around here - although Seth was still in the hospital at the time. David, Marcie and Will all ran 100.4-101.4 fevers today; please pray Seth doesn't get anything from them! I'm hoping and praying it's just something weird and fleeting. They don't have any other symptoms, and as always they are teething. The "Calvin and Hobbes" fans among you will appreciate the title of this post. Isaac is really into those comic books now and gives us some laughs when he shares his favorites with us. But seriously, it's true. Sorry this is such a late update. Seth is doing great as far as being happy and acting healthy and getting everywhere and playing like crazy, but he's still wheezing some and satting lower in the mornings. We are getting our own nebulizer, so that ought to help. This cold caused his respiratory passages to really inflame and swell. 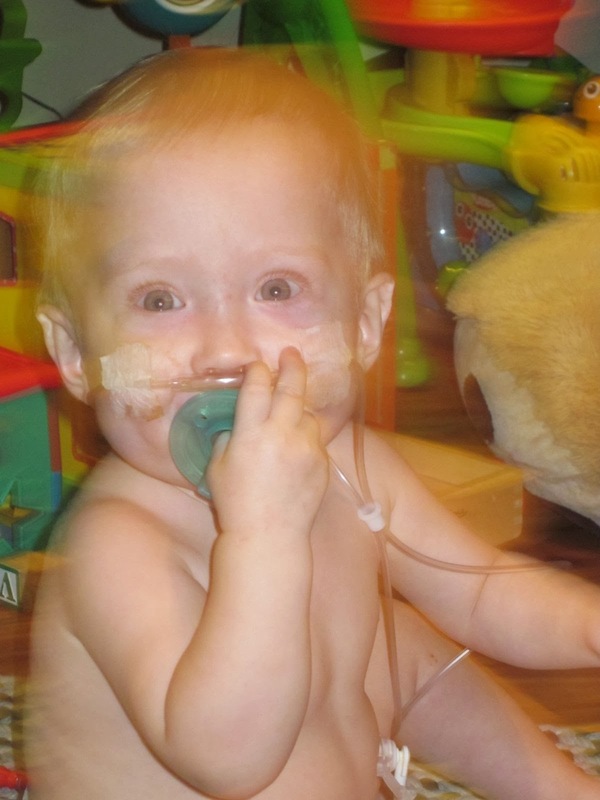 Isaac had a virus that did that once, too, putting him on inhalers for a few weeks. I remember it happening to me as a jr. higher, as well, so I am hoping the morning wheezing is just associated with this particular cold and not longterm asthma. We'd appreciate prayer for that. Speaking of which, thanks for praying that the traumatic deep suctioning event would not set Seth's eating/drinking back. It certainly has not had any apparent effect! He seems willing to eat just about anything, and he drank an ounce of chocolate milk for Sam the other day. He'll sip on things for me, too. 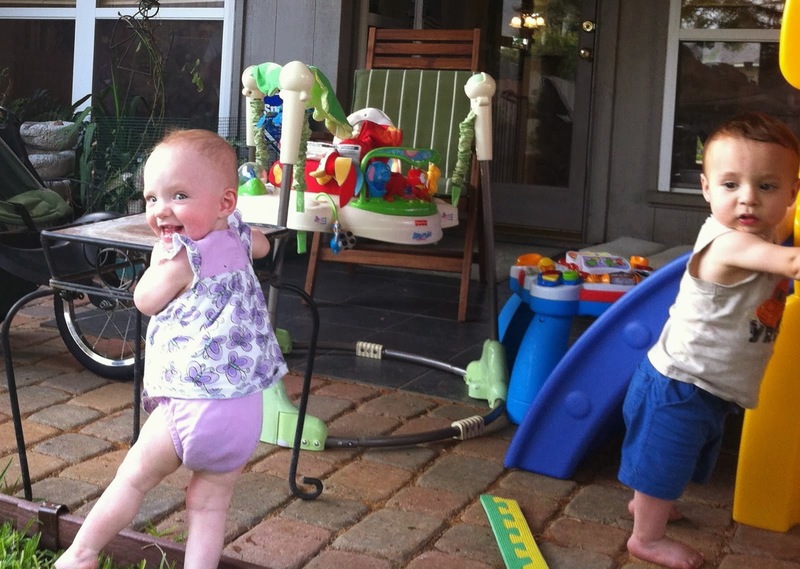 The kids are cute and busy and keep us on our toes! I tried to do it for a couple of hours by myself yesterday morning as my normal helper was out of town. Not a raving success by any means. :} I just can't keep my eyes on all five at once while meeting each baby's needs and doing Seth's treatments! So I thank God for providing continued help. He obviously knows I need it, too! I'm so grateful He knows ALL our needs! Happy David! He was definitely the most affected by the craziness of having Dad gone and Seth in the hospital. He is SO much happier and less insecure now that we are all together again. Gracie - in a boy's onesie. Oops! Marcie is in the distant background eating dirt. Oops again! Marcie - yes, with dirt on her mouth. Marcie enjoying a bubble bath; dirt's all gone! Marcie and Will enjoying the porch. The days are much cooler now, thankfully! 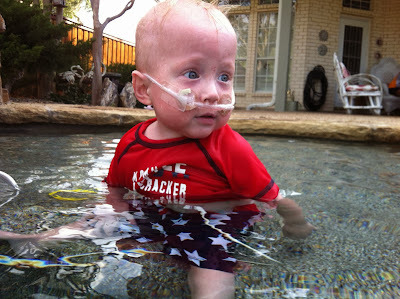 Seth hooked up to oxygen and the feeding tube, but enjoying Don and Sandi's pool nonetheless! Yes, he got home early this evening, praise God! 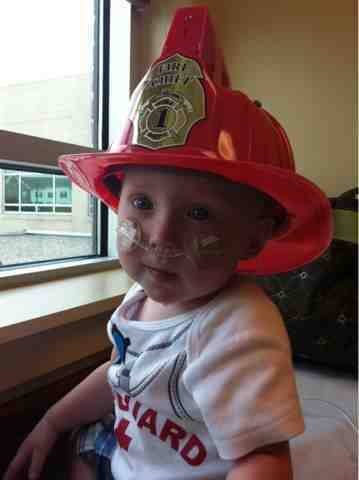 He is on 1/2 liter of oxygen still, but doing very well. He is VERY happy to be back. 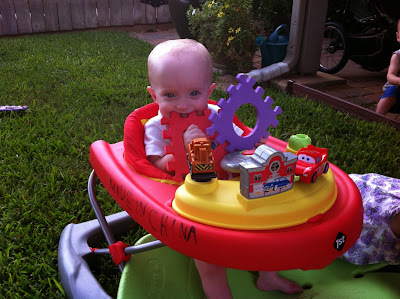 Playing with toys and his siblings and grinning at anyone who will look at him. It's late, so more details tomorrow. I just wanted to let everyone know that the Jones 8 are all under the same roof for the first time in weeks. Thank you all for your prayers, and please keep them coming as we head into another flu season! 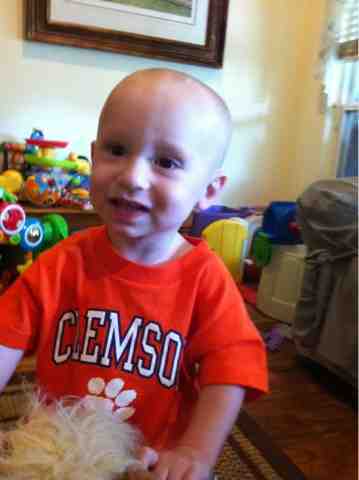 I know lots of churches and hundreds of people were praying for Seth today. I am thrilled to report, to the glory of God, that he is MUCH better. His X-ray is vastly improved, and He is back on nasal cannula rather than the high pressure Vapotherm, on 1.5 liters/minute and satting 99%. He still sounds kind of gunky - the resident just listened with her stethoscope - but he has good movement of air nonetheless. We praise and thank God for all He has done in just one day. One disappointing and concerning thing I found out was that the respiratory therapist was deep-suctioning him, one of the causes of his oral aversion in the first place from the NICU. I am very unhappy about that because I had specifically asked that he not be suctioned into the back of his throat. When I heard him gagging and dry-heaving I realized what they were doing, much to my dismay. (I was staying away so he wouldn't associate me with the distressing nasal suctioning.) I think they understand now how strongly I feel about NOT suctioning his throat and trachea! It's not worth months of additional oral therapy to overcome. Please pray that his eating and drinking will not be set back by this, Lord willing. He has yet to take anything by mouth since this latest illness. I had a lovely afternoon with the babies at home, just hanging out and playing with them while Gavin was at the hospital. Then I switched out with him, and my dad and sister-in-law were here for a few hours too. How nice! Seth had a great day. Aunt Sam stayed with him this morning while Gavin and I went to church. That's the first time in 6 weeks I've been able to get to church, the kids have been sick for so long! Hopefully Seth will settle down soon so his old mom can get some rest too. 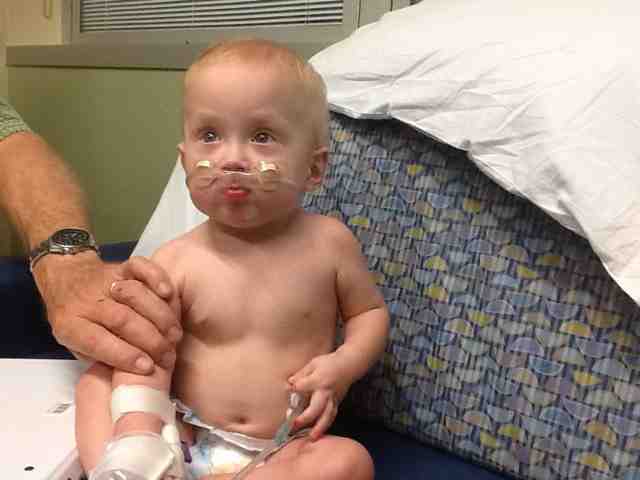 All the breathing treatments really amp him up! He's pretty hilarious and rambunctious. Oh, and he's been walking across his crib! So right now he's the only other baby besides David to really take steps, and he's not even 10.5 months adjusted age yet (when Isaac took his first steps). So much for being the "delayed" baby! He also initiated a game of peekaboo with me, covering and uncovering his own face with his hospital gown and laughing throughout. The funniest part was when he put the hospital gown above his head and then below his head, but never actually covered his eyes. He still wanted me to say "Where's Seth?!" even though I could see him the whole time. :) Adorable! 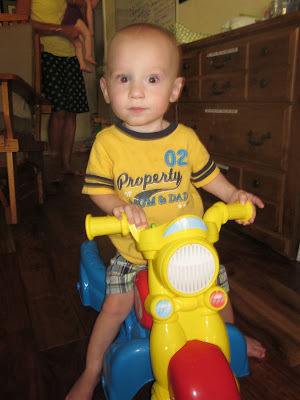 Thanks for praying for Gavin, who is still definitely fighting the jet lag and reverse culture-shock on top of it. They say to allow one day for each hour of time change, so that puts Gavin at two weeks recovery time! That's hard to do when you have five babies and an active nine-year-old, not to mention one baby in the hospital. 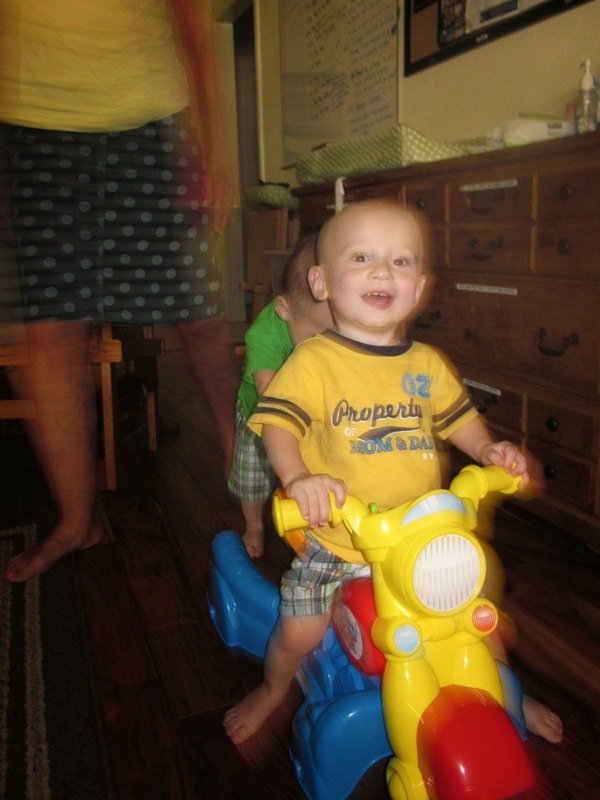 :} Gavin is frustrated at not being in better "form" for his family, but we're so glad he's home! David and Marcie could not stop grinning at him, and both Marcie and Seth had to climb into his arms as soon as they saw him. Gracie laughed and grinned like her silly little self as always, and Will had to feel his face and beard as though to re-familiarize himself with his daddy's features. Isaac was HAPPY and planned a little celebration for us as a family. We are SO blessed! Love and gratitude, with thanks to The Father for His mercy and powerful healing yet again! This is such a funny face he keeps making! He's not satting great (88-92%), so they are changing out the sensor to see if it's just a problem with the sensor and not that his blood oxygenation is too low. He's happy when he's allowed to play, unhappy when disturbed in that play - surely that's a good sign? 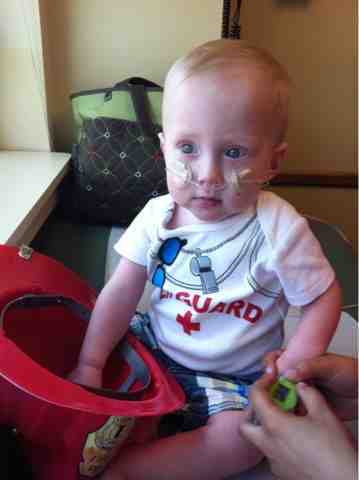 But we don't know much yet about his lung function or condition; the doctors haven't rounded yet today. We'll keep you updated - thanks for caring!! We just received these from the local magazine. I don't think I can publish them because the magazine hasn't been published yet, but here's the link to the photographer's gallery. Click on "client login" and after you click on our family's portrait, type in jones (all lowercase) to be able to see all the other photos. There are only a few, but at least one cute one of each baby. After initial optimism that Seth's increased work of breathing and need for Vapotherm were due to shifting mucus, the attending physician is now concerned that he is doing worse and looking/sounding worse on exam. Therefore, she wants to look for other causes of his worsening condition. They repeated his viral panel to check and see if he has Respiratory Syncitial Virus on top of the basic "cold" virus. (RSV acts like this, worsening a few days after initial infection, hence her vigilance.) The test came back negative, so that's a huge relief! They are also giving him another dose of Lasix to try and clear out any extra water that's causing the crackles in his lower lungs. He's not the happiest little camper, but he sure is a cutie! Please pray for good rest for him (hard to get when he's receiving treatments and being suctioned every 3 hours). We THANK GOD for all the help we're receiving with all the babies and Isaac! The Lord is so gracious and compassionate. Clearly He is honoring your prayers, including for us parents and Isaac. Learning that the ball lights up!! He was entranced by Uncle Calvin, couldn't take his eyes off of him. Is it the beard? I just talked with Carrie for a while at the hospital. Seth's newest x-ray came back and things have improved. His color is better and he is acting quite normal and happy-- crawling all over the place and giving Carrie a big hug when she arrived. The doctor thinks that last night's events may have been largely due to some "junk" inside of his lungs coming loose and blocking his airways temporarily. They also said that it is not too unusual for a patient to take a downward dive like this shortly after plateauing briefly, then improving after that. Given this morning's tough report, this more recent news is much easier to handle. I was kind of a basketcase this morning. A combination of jet-lag, Marcie being scared to come to me, and the bad report on Seth really had me thrown for a loop. I kept praying, "Lord, what are you doing here?" I know I don't need to know specifics, but just need to remember He has it all in perfect control and is holding Seth (and all of us) in His everlasting arms. I'm doing much better now, with a few more hours of sleep under my belt and Seth's encouraging report. Today is another wonderful reminder of the amazing network of friends we have here that have come to help with the babies (or just take them home with them)! Thank you all so much! Seth had to be suctioned every four hours overnight to keep his passages clear. The last time he was suctioned the nurse saw he was noticeably retracting, i.e. he was working really hard to breathe. The pulmonology doc agreed, so they switched him over to vapotherm, which is high-flow nasal cannula (a larger version). He is on 4 liters flow per minute and 40% oxygen but is still only hovering in the high 80%'s last I heard from Sam a few minutes ago. I am heading to the hospital as soon as possible. Gavin is jet-lagged, exhausted (we both are), discouraged, and overwhelmed. This is a lot to be hit with while still adjusting to being back in this time zone and surrounded by the chaos of 10-month-olds. He is also very grieved about Seth's struggles and the fact that he is worsening rather than improving. We are both very concerned and appreciate all your prayers and help. We still need both desperately, also on behalf of Seth and the rest of the family. Seth's latest X-ray actually looks a lot worse, although the main collapsed portion has somewhat reinflated. Thanks for your continued prayers! Also for Isaac, who the chaos is beginning to affect, and the other babies, who are progressively more out-of-sorts and whiney and clingy, making at-home time very stressful. I am going to try to stay home all day tomorrow and just BE with them while Gavin stays with Seth. I am so glad to have Gavin home again! I'm sitting in the San Francisco airport, about to board the last leg of my journey. This has been a LONG Thursday. I left PNG on Thursday morning about 30 hours ago and it's still only mid-afternoon on the same day! I've gotten some news from Carrie. Seth is doing well today. He was needing a lot of oxygen to keep his saturations up, but then they discovered that his nasal passages were really clogged up. They were able to clear them out quite well and his oxygen requirements went down significantly (from 2 liters to 1/2 liter). He's on a diuretic to get water off his lungs. 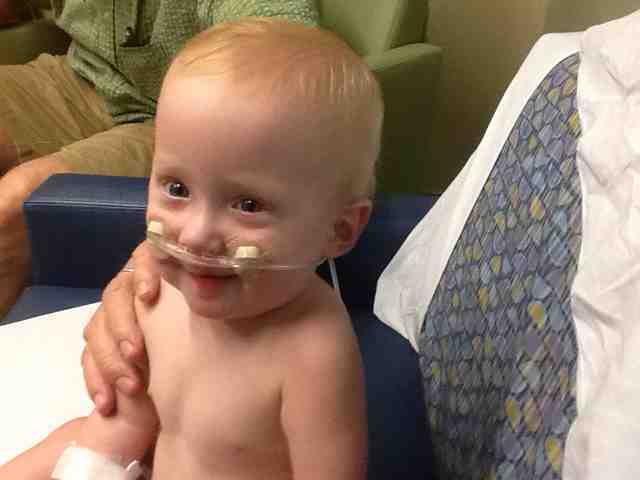 His tests came back positive for rhinovirus and negative for bacterial pneumonia. He's in good spirits and, Lord-willing, will be home soon. Thanks to all for your prayers and support for the family while I've been away. It was a very good, productive trip. It was hard to leave the place and community of PNG, but will be wonderful to see my family again. It's no wonder we are so well taken care of with all the prayer support we're receiving around the globe! God has been so very gracious to us. So here's the story: Seth was pretty miserably sick over the weekend, with Saturday being the worst, but improving a bit each day from Sunday onward. 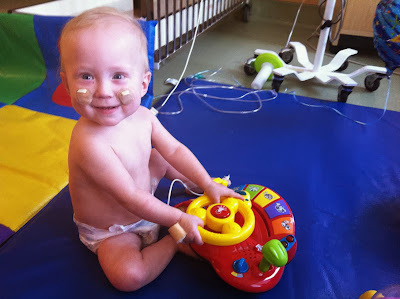 When I called his pulmonologist on Tuesday to schedule a follow-up, it was just to be sure everything was okay, that the crisis was past, because Seth was acting a LOT better. He was crawling, playing, clapping, laughing, babbling, and deciding sleep was overrated (whereas before it seemed he woke up just long enough to cry and go back to sleep). They wanted to make his appointment for Thursday, but I had another appointment for the babies already scheduled on Thursday, so asked for an appointment yesterday even though it meant I would have to drive twice as far. Thank God for that! Who knows how bad he might have gotten overnight? He went from having good oxygen saturation at home to poor saturations by the time we reached the doctor's office. The staff started rushing around, called in a nurse to listen to his lungs, she couldn't hear breath sounds on his left side (it was "very quiet"), so she called the doctor out of another patient's consultation, he came in and listened, noted Seth was working harder to breathe and was breathing shallower than normal, sent him for an x-ray, compared the x-ray to his x-rays taken the last time he was in the hospital, identified partial lung collapse and possible pneumonia on the left side (a lot worse than the last time we were admitted), got on the phone with the hospital and got him a room on the Pulmonology floor within half an hour. Whew! There were absolutely no problems the entire process. The Lord really directed our paths and went ahead of us. And Seth, though tired and hungry, still acted fine. He was definitely more pale and breathing differently, but he didn't act distressed at all, thank God! 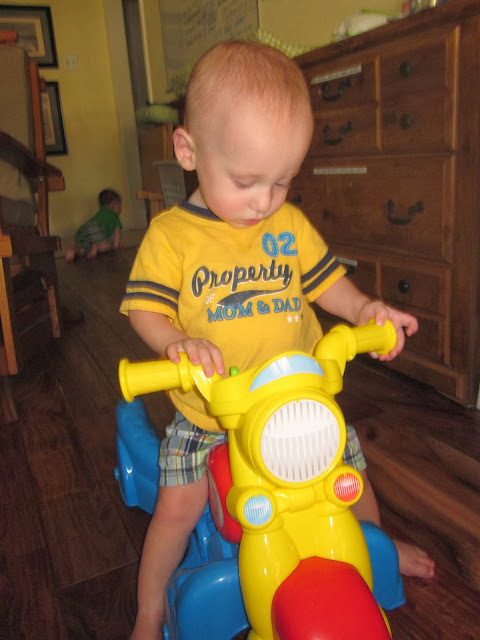 The doctor explained to me that Seth, while feeling so much better as he got over the respiratory virus, was falling farther and farther behind in being able to fill his lung with air, hence the collapsing. In addition, his viral infection seems to once again have paved the way for a secondary bacterial infection. The pulmonologist said this has to stop. 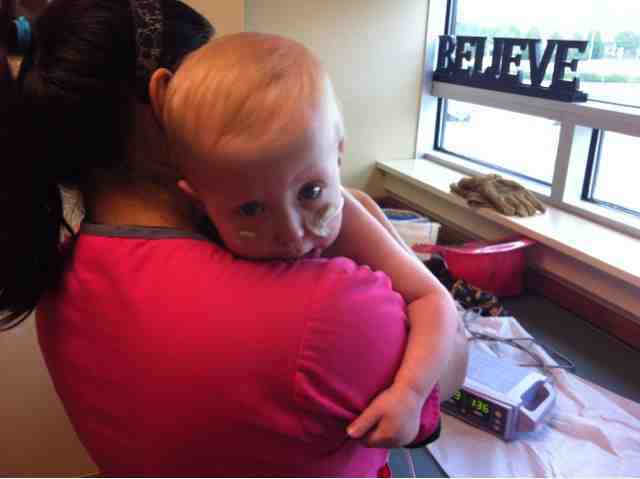 Seth can't keep getting one infection on top of another or his lungs won't have the chance to heal and grow. His issues are so interrelated: He needs to learn to take all his nourishment by mouth, but his lung illnesses make him feel weak and crummy, completely disinterested in food. He also vomits when he feels gross, so he can't keep in enough nutrients to grow, so his lungs too aren't able to heal and grow as they should. 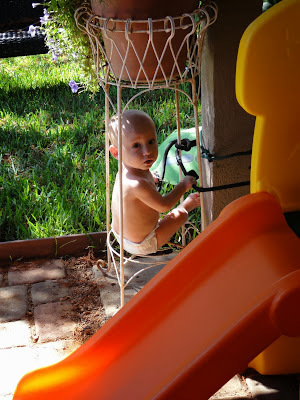 In order to avoid infections long enough to give Seth the time and growth he needs, we have to stop taking the babies to crowded public areas or any place like the church nursery or Bible Study Fellowship Children's Program (sob!). We also have to re-double our hand washing vigilance at home, especially Isaac when he comes from school. In response to all your sweet concern, I am actually doing great. I got a good night's sleep with early morning help from sweet Sarah G., I have so many wonderful people stepping up once again to serve at home, and Nanny Sam (I love her, I love her, I love her!) stayed at the hospital all night. She's the one who most needs prayer. Seth didn't sleep well, which of course meant she didn't, and whenever Seth would finally fall asleep someone would come in for some test or procedure or treatment and wake him up! 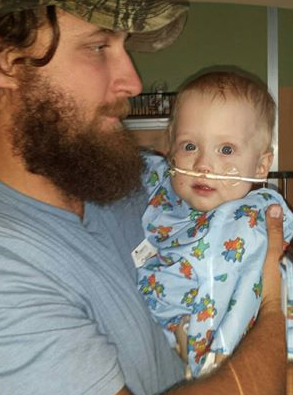 Carrie & Seth are headed to Children's Medical Center in Dallas as I write this. At Seth's pulmonology appointment this afternoon, his doctor found his left lung to be partially collapsed. The plan is to admit him & treat him for pneumonia, adjust his meds...and pray. (I added the last, but know the doctor would heartily agree.) The pulmonologist says Seth is worse than when hospitalized 3 weeks ago. Gavin is in Australia in his long journey home from Papua New Guinea & is scheduled to arrive in Dallas late tomorrow (Thurs) night. I am leaving this weekend for 9 days overseas. Please pray for all of us, including the other babies and Isaac, and for our wonderful volunteers. His strength is perfected in our weakness; He does all things well. Warm regards & many, many thanks from The Quintessential Grandma. I guess Seth has had his share of attention in pictures the past few posts so I don't need to feel guilty that there are no pictures of him. He's been sleeping most of the time, so that precludes a lot of photo ops. Seth has no voice at this point. It's so pathetic! It's also sad that he is doubly sick with cold and gastroentestinal yuckies. Poor punkin'. He remains perpetually sweet, though! Thanks again to all the volunteers who make LIFE possible right now! With Seth still receiving treatments lasting 25 or so minutes every four hours around the clock (last night's was 3 a.m.), I appreciate the help and prayers even more than normal. Seth's diaper needs a desperate change. Gotta run! Mom has been here a LOT and done more dishes and more laundry than anyone can keep count of - thank you! Dad has also been here probably more than he's been at his own house. :) Thank God for close grandparents when all five kiddos and the nanny are sick. Please pray for stamina for us all. This has been a demanding past month. There are more baths happening around here than normal, in addition to the loads upon loads of yucky laundry! 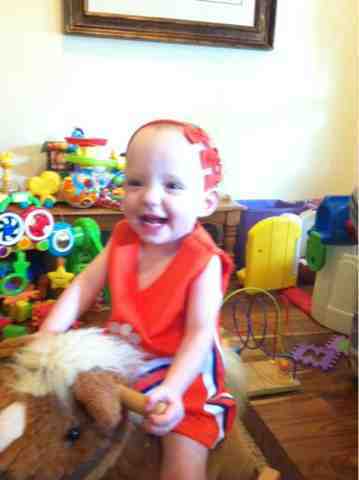 Gracie is in love with her little pony. She really knows how to ride it, too! The kids are moving in a herd more and more. The cutest thing is their crawling in a line. And another, with Will looking this time. Re: Seth, of course, written by Sam to the same Aunt Jennifer of the nebulizer we're using (see a couple posts ago): He's holding in there. His sats have been ok today, mostly low to mid 90's but occasionally higher! He's coughing so much and definitely moving a lot of junk around (and out.) He's thrown up a few times including just a bit ago allllll over Isaac's bed/floor. I think overall he's on the incline but it'll be a slow, uphill battle as it was in the hospital. P.S. from Carrie: Marcie and Will have both vomited too, and Marcie and David have diarrhea. Please pray for all our precious kiddos, and THANK YOU as always! It's 11:30 PM for me in PNG time but 8:30 in the morning yesterday in Dallas. I just texted with Carrie and Seth did OK through the night, satting in the low 90's, which is acceptable, but he has not started getting rid of the stuff in his lungs yet. Please continue the prayers for them as they struggle through this time. Thank you so much! My time here in PNG has been wonderful and productive, but tough knowing Seth and the other kids have been sick so much. I'll be home to them on Thursday. It will sure be good to see them! Seth is hovering just above the "take to the hospital" guidelines, perhaps largely due to the mucolytic and back-thumping loosening up the nasty gunk and temporarily therefore clogging airways more. PLEASE pray, if the Lord is willing, that Seth's condition turns around and has a great night's sleep and doesn't have to be taken to the ER. And for strength and stamina and peace for us all if he does. Well, Seth clearly WAS feeling better for at least a while on Thursday! His lungs and cough have sounded a lot more full and junky today. Thankfully our afternoon helper is a nurse and brought her stethoscope. She could hear the congestion had "filled" his lungs to the very top, whereas yesterday it was only lower in his lungs. So, after calling the doctor and searching several pharmacies for a mucolytic to break up the nastiness he's struggling to breathe over, we finally found what we needed at Kroger of all places. Last week at the hospital it really seemed to help him turn the corner and get better a lot faster. The breathing treatments haven't helped a whole lot, but we're borrowing a nebulizer for the inhaled mucolytic and giving him one of his inhalers that way instead. It may help; we sure pray so. He is definitely worse today than yesterday, but thank God he's still satting well on the one liter of oxygen and he slept well last night, even during his 4 a.m. treatment. We're still doing them around the clock; SO thankful for help with the other babies, especially after tonight! I am also so very, very grateful for Sam's calmness and experience and hard work with Seth despite not feeling well herself. Please pray she can recover from her own raw throat and sinus drainage, poor girl! Thanks for bringing the nebulizer over and leaving the game for it, Jennifer!